In April, the National Alliance for Broader Impacts (NABI) held its fifth annual Broader Impacts Summit at Skamania Lodge in Stevenson, WA. NABI is a network of more than 600 individuals working together to build institutional capacity, advance broader impacts, and demonstrate the societal benefits of research. NABI members come from educational institutions, museums, science centers, zoos, botanical gardens, professional societies, private industry, foundations, and other organizations. A list of member institutions is available on the NABI website and you can read about the objectives of NABI in a prior post on the MCB Blog. Established in part with funding provided by the Division of Molecular and Cellular Biosciences, NABI events and resources help researchers create and develop impactful broader impacts activities. At the summit, Dr. Suzanne Iacono, Head of the Office of Integrative Activities (OIA) at the National Science Foundation, delivered a keynote address entitled Broader Impacts at NSF. She noted, across proposals, student education and broadening participation were two main focus areas. These areas were also a major point of discussion in several of the sessions at the meeting. The theme of the three-day summit was the “Power of Partnerships.” Sessions focused on three strands: innovative BI approaches and activities, faculty and student development and training, and broader impacts infrastructure, skills, and tools. Research into the role of partnerships in empowering high-quality outreach, models for public engagement partnerships, and best practices in the assessment and evaluation of broader impacts were presented, which created a foundation for data-driven conversations about broader impacts for the 21st century and beyond. Presenters discussed how to construct strong science education and build outreach partnerships with a diverse array of partners such as citizen scientists, startup companies, museums, community partners, STEM graduate students, engineers, and faculty. Summit participants also learned how to use crowdfunding, cinema, social media, and Twitter as tools to facilitate outreach. Discussion also focused on how to reach non-traditional public audiences, minorities underrepresented in STEM fields, and the next generation of scientists. 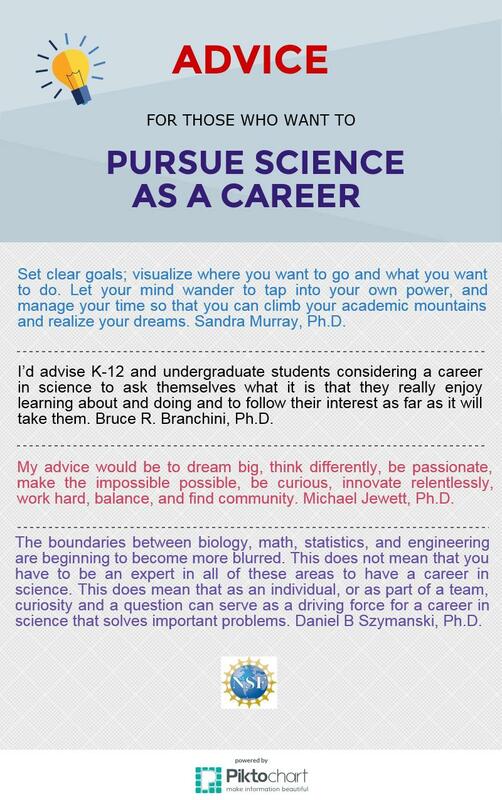 Panelists offered lessons learned while establishing outreach partnerships such as University of Wisconsin – Madison Science Alliance, which connect scientists with K-12 educators, parents, lifelong learners, students, and others. The Summit had a strong focus on the future of BI and NABI. Sessions engaged member feedback, discussed the creation of a peer-reviewed journal about broader impacts, and considered the role of the NSF CAREER Program in integrating intellectual merit and broader impacts. Slides for each presentation are available at https://broaderimpacts.net/2017-schedule/. If you are interested in becoming a member of the National Alliance for Broader Impacts network, visit their website at https://broaderimpacts.net/join-nabi/ to join for free. Registration for the next summit, which will be held at the Providence Biltmore April 25-27, 2018 will become available on the NABI website at https://broaderimpacts.net/. This work is partially funded by the Division of Molecular and Cellular Biosciences, Award #MCB – 1408736. It’s a true pleasure to say hello to the MCB community by publishing this blog post on the first day of my service as the Division Director. It would be an understatement to say I feel truly honored to serve in this role. I am delighted to join a group of dedicated Program Directors and staff that have as their core value service to our community and support of the exciting and impactful science that our grantees carry out. However it would be untrue if I didn’t admit to a little nervousness. My very first order of business is to welcome a CAREER panel and that puts up front and center a thank you to the reviewer community without whom we could not do our job and to whom the system depends. Please keep doing what you do so well and thank you in advance! My next order of business is to embark on a listening tour both within NSF and with our major stakeholders. I’d like to hear what’s on your minds, what gets you up in the morning and what keeps you up at night. My proverbial (and e-) door is open so feel free to reach out and share your thoughts with me. I hope to meet as many of our community as possible, either physically at NSF, at a scientific meeting, or where ever our paths might cross. Next – a big shout out to Greg Warr who so ably kept this DD seat warm; and to Theresa Good who I can already tell will shepherd me through this transition period with her commitment to excellence, competence and generous help. Lastly many people have asked me why I wanted to take on this challenge. The answer is….. I cannot imagine a more worthwhile use of my time and energy than supporting this community and advocating for our science while continuing to learn new things every day. Happy new academic year, happy end to fiscal 2015 and cheers to FY16!